Our fajitas are grilled-to-order and served with Mexican rice, refried beans, grilled onions, jalapeños, fresh hand-rolled tortillas, shredded cheese, pico de gallo, guacamole, lettuce, and chips and salsa. Available in 1/2 pound (1-2 people) & 1 pound (2-3 people) orders. Not enough? Add more by 1/2 pound increments. Pete’s pro tip: Get extra! It’s even better mañana. Fajitas are in our name, so yeah, they’re pretty darn good. 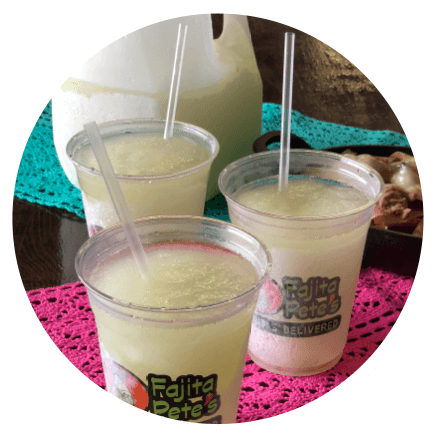 You saw that right, frozen Pete’s Ritas To-Go available for carry out or delivered right to your door. If you’re packing for a tailgate, planning a party, or just don’t have access to a good blender, it doesn’t get much more convenient than frosty gallon jugs & mugs of Pete’s Ritas To-Go. Two tortillas filled with chicken or beef fajita. Served with rice, beans and a side of queso. 2 tacos topped with fresh pico de gallo and shredded lettuce served with rice & beans. Fajita beef or chicken rolled in corn tortillas covered with tomatillo sauce and served with rice and beans. One huge tortilla filled with beans, chopped beef or chicken and a dab of queso. Rolled up and topped with a tad more queso and served with lettuce and tomato. A roasted poblano pepper stuffed with tender grilled chicken breast, topped with sour cream and Monterey cheese. Served with rice, beans and tortillas. Fajita chicken or beef on a bed of lettuce and topped with shredded cheese, guacamole, sour cream, tomatoes and freshly made tortilla strips. Three tacos with your choice of beef or chicken, topped with lettuce and pico de gallo. Served with rice and beans. Two tacos with your choice of beef or chicken, topped with lettuce and pico de gallo. Served with rice and beans. Chicken breast topped with pico de gallo and melted Monterey cheese. Served with rice and beans. Your choice of beef or chicken served with rice, beans, lettuce, pico de gallo, sour cream and tortillas. Three lightly fried corn tortillas rolled with shredded chicken and Monterey Jack cheese. Served with rice, beans, side of queso, sour cream & guacamole. Once chicken or beef taco, queso, rice and beans. 1/2 cheese quesadilla with rice and beans.